The president's repeal of DACA affects the families of students at Suncoast. On September 5 President Trump made an announcement that the Deferred Action for Children Arrivals policy, created by former President Obama, was being repealed. The program, also known as DACA, was established in order to protect undocumented immigrants, that arrived in the United States when they were children, from deportation. In six months DACA will officially be repealed. According to CNN, this policy has protected around 800,000 immigrants. This change affects the families of several students at Suncoast. “When I first heard about Donald Trump’s announcement of repealing Obama’s DACA act, I was nervous. Although the repeal would not affect me. It would affect my family close and far. I currently have two cousins on DACA studying at FAU,” said senior Velqui Perez. For now the people protected under DACA must wait to find out what President Trump will decide next on immigration policy in the United States. This has created distress for the families affected by the repeal. “My family has so far been torn apart. They are scared and angry that Mr. Trump would even consider to repeal the act when most of the people receiving aid from DACA are good and have a clean record,” said Perez. According to CNN, the situation now for those being affected after the repeal, is that they still have the opportunity to renew their permits if they are going to expire in the next six months. Yet, there will be no more children from families of new undocumented immigrants that will be fully protected from deportation. Superintendent Avossa released a statement right after the policy was ended. “Schools in Palm Beach County do not, cannot, and will not ask students or their parents for information about their immigration status,” Avossa said. This ensures that those affected by the repeal in Palm Beach County, including any families of students from Suncoast, are protected from having any information released by the school district, which could result in the risk of deportation. The DACA policy was put in place to allow the children of undocumented immigrants to have equal opportunities as those who were born in the United States. The Palm Beach School District is ensuring that the same opportunities in education will continue to be given to all students. “Our Constitution guarantees all children, regardless of immigration status, equal access to public education. Despite today’s announcement, students who were not born in the United States are entitled to attend public school,” Avossa said. “These dreamers or DACA applicants have jobs, with data showing that repealing DACA would just harm the U.S. economy and hurt our future workforce,” said Perez. President Trump’s reasoning behind removing DACA has been heavily argued. His reasoning is that citizens born in America were unfairly losing their jobs to people living in the country that were undocumented, according to the New York Times. President Trump is now expecting Congress to come up with a new policy that has to do with the immigration issues and the status of the, soon to be unprotected, immigrants protected by DACA, according to the New York Times. Also, groups have started to take action against President Trump’s repeal. 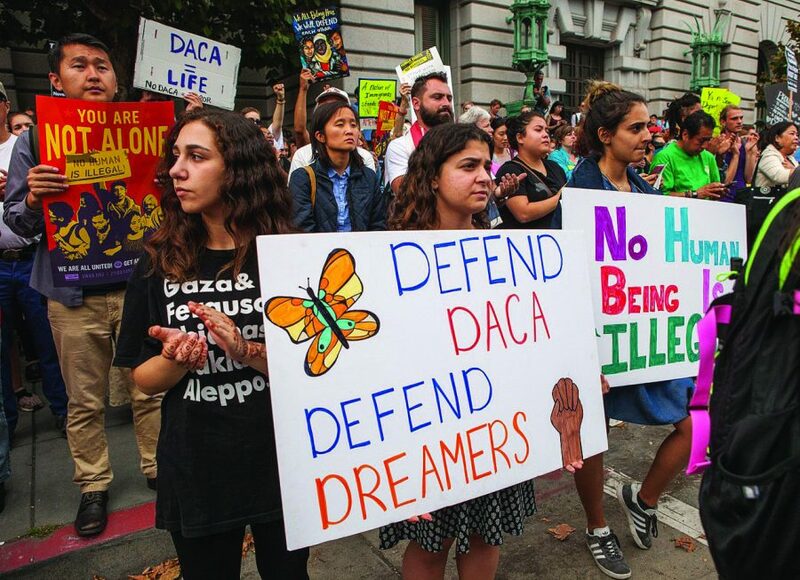 According to the Washington Examiner, on September 18 the National Association for the Advancement of Colored People decided to sue President Trump, Homeland Security and other government groups and officials in Washington D.C. Also, protests have been occuring so people can show their disdain toward the repeal of DACA and to show their support for the Dreamers.